Kevin wrote earlier this morning about the horrific shooting at Charlie Hebdo headquarters in Paris. Hebdo is a satirical French magazine that published controversial cartoons lampooning Islam. The shooting left 12 people dead, most of them writers for the magazine. Two French police officers were also killed. The gunmen opened fire with Kalashnikovs, Molins said. He said they shouted “Allahu Akbar” and said “they were avenging the Prophet.” Separate video captured one gunman saying the same outside the building after the shooting. 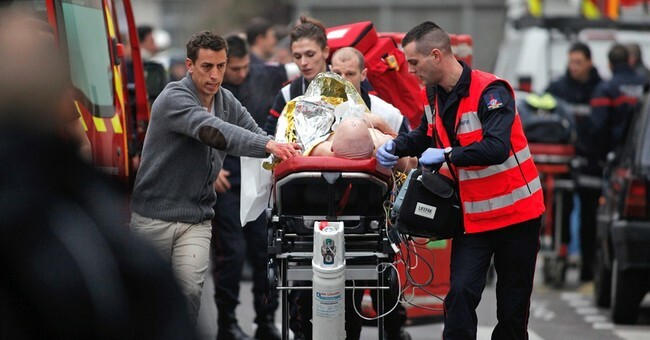 The gunman fled in a black Citroen, killing at least one police officer in three exchanges of fire with police. They then carjacked a Clio near the péripherique and fled. The bodies of those killed in the Charlie Hebdo magazine offices are being removed from the building now. Five of those murdered have so far been named. They are the magazine’s editor and cartoonist, Stéphane Charbonnier, known as Charb; Bernard Maris, an economist and writer on the board of Charlie Hebdo; and three more cartoonists: Jean Cabu, Georges Wolinski and Bernard Verlhac, known as Tignous. Five other staff at the magazine are believed to be among the 12 dead. I had gone to pick up my daughter from daycare. Arriving at the door of the newspaper building, two hooded and armed men brutally threatened us. They spoke French perfectly ... claiming to be al-Qaida. The attackers, who were masked, are still at large. The French government raised its terror alert to the highest level. Guy and Katie also have updates and posts on this tragic and infuriating act of violence. Dan reported on Secretary of State John Kerry's reaction to the shooting saying, "Free expression and a free press are core values -- they are universal values -- principles that can be attacked but never eradicated because brave and decent people around the world will never give in to the intimidation, and the terror, that those seeking to destroy those values employ." While the Western world has condemned the attack, Fareed Zakaria recently said on CNN that he’s waiting to hear the reaction from leaders in the Muslim world about this horrific shooting, hoping that they condemn it. Charlie Hebdo has a long record of mocking, baiting and needling French Muslims. If the magazine stops just short of outright insults, it is nevertheless not the most convincing champion of the principle of freedom of speech. France is the land of Voltaire, but too often editorial foolishness has prevailed at Charlie Hebdo. This is not in the slightest to condone the murderers, who must be caught and punished, or to suggest that freedom of expression should not extend to satirical portrayals of religion. It is merely to say that some common sense would be useful at publications such as Charlie Hebdo, and Denmark’s Jyllands-Posten, which purport to strike a blow for freedom when they provoke Muslims, but are actually just being stupid. Regardless, French citizens are gathering at Place de la Republique, standing in solidarity for the ideals of a free press that seemingly came under attack at Charlie Hebdo HQ today.